We realize that for a couple of Rocky Mountain-raised boys from Salmon, Idaho, drawing inspiration for the name of our company from the fennec fox of North Africa may seem to come out of left field. But when you think about it, today’s retail world is similar to the climate of the Sahara Desert: competitive, with harsh conditions. We were intrigued to learn about the hardiness of the 2-3.5 lb fox, whose comically-large ears act as conductors that draw heat away from the body, allowing the animal to stay cool. Nocturnal so as to avoid the heat of the Saharan desert, with a coat that acts as both an insulator against cooler nighttime temperatures and a layer against the animal and scorching sand, the fennec fox makes its home in an underground den and survives off the sustenance of whatever it can find — plants, rodents, eggs, reptiles, insects. It was exactly this level of hardiness, adaptability, and strategy, we realized, that our emerging company would need to thrive — and it’s these precise values that continue to resonate with us as hunters. 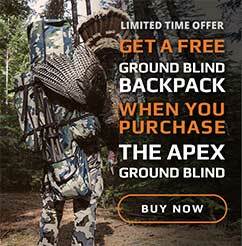 XENEK ground blinds are made for the kind of people who will patiently wait for days in anticipation of the perfect opportunity; who deeply consider the impact quality gear can make on a hunt; who spend the time they don’t spend hunting honing skills that will allow them to be more effective in the field. We’ve made it our mission to create durable, innovative gear that helps you get the most of out your time out there, because like you, we can tell the difference. And it’s likely, if you’re here, that there’s a little bit of fennec fox in you, too — no matter how far away you may find yourself from the Sahara Desert. Maybe you’ve heard that old saying: “A partnership is the only ship that never sails.” We take every old saying with a grain of salt, but in our case, truer words were never spoken. The partnership behind XENEK is the reason we’ve made it this far — our individual time, energy and enthusiasm individually never would have been sufficient. And we knew that when we started. As the general manager for Trophy Taker (an archery accessories company) for nearly 14 years, and now, the CEO of Huntin’ Fool, Jerrod brings a solid understanding of product development, manufacturing, business savvy, and the overall outdoor industry to the XENEK table. Jerrod has the ability to wear many hats, all of which have brought experience and credibility to our emerging company every step of the way. Jerrod’s time in the outdoor industry has also afforded him the opportunity to spend countless days hunting in the field, where he has experienced consistent successes and developed practical bowhunting experience. As such, Jerrod has a nose for truly effective products that perform well in the field. He’s our biggest critic when it comes to creating exceptional products and avoiding hype. As a practicing licensed structural engineer and the principal of his own engineering firm, Jake brings a unique perspective to the partnership. A self-proclaimed “enginerd,” you may hear him rattle off nerdy terms like “modulus of elasticity,” “stress/strain curves,” or “moment inertia” — but at the end of the day, our enginerd is the key to the success behind our products. Jake’s expertise has also helped us streamline many of the stages of each project, such as product development and value engineering, allowing us to eliminate unnecessary costs where we can — but never skimping when product integrity is in question. Perhaps an unusual trait for an engineer, Jake has the ability to strike a balance between practicality and the calculator to create remarkable products. It’s safe to say we knew what we were getting into when we started. We have worked together in some capacity off and on for nearly 30 years now and have a pretty good idea of our own strengths and weaknesses — as well as each other’s. We spent hundreds of hours in the same wrestling room in high school, and hundreds of hours running up and down mountains setting chokers and running chainsaws together on logging jobs where conditions ranged from 20 below to 100+ degrees on hot days. We kept in touch while each of us managed separate companies, helping each other through the growing pains, tough economic times, and the day-to-day struggles that all businesses face. It wasn’t until 2008, though, that we started hunting together. During that time, we’ve witnessed each other’s reaction during a grizzly bear charge, spent sleepless nights huddled around fires in the wilderness, rolled out of bed at 2 a.m. when we thought that was the best choice to increase our hunting odds, and packed ridiculously heavy packs into remote water holes. During that time, neither of us have ever slept in, thrown in the towel, or in general “tapped out.” We trust each other more now than we ever have. In the XENEK partnership, our core values are not only clear to the both of us, they’re time-tested. Ethics are more important than gain, work should be shouldered, not shirked, and constructive communication is always the most important thing. Whether through time in the field, product development, or in business, we’ve proven our commitment to that ultimate goal: doing what it takes to make the time in the field the best it can be — whether that’s by being the best hunting and business partner each of us could ask for, or by making quality gear that reflects the hard work we’ve put into developing it.